Flagler Estates looks no different from the ground. It was an odd request that generated a spirited discussion this morning between Flagler County commissioners about what to do with some of the 1,939 parcels that form the nearly worthless and vacant subdivision known as Flagler Estates, in the northwest part of the county. The most attention the subdivision has garnered lately is as the dumping ground of murdered individuals on two separate occasions. Jeffrey Cohen is a New York resident who bought five 1-acre parcels in Flagler Estates in March 2012, for a total of $10,000. The combined value of the parcels is $1,500. The combined taxes Cohen last paid on the properties total $25. He now wants to donate the parcels to the county. County Administrator Craig Coffey recommended to the commission that the county accept the donation, though he said it could cost taxpayers up to $5,000 for title, survey and closing costs. A divided commission rejected the proposal, 3-2, with Nate McLaughlin leading an adamant opposition that showed no interest in unburdening private property owners who made poor investments, or setting the county on a course that has no clear objective. He was joined by commissioners Charlie Ericksen and Frank Meeker. Commissioners George Hanns and Brabara Revels voted to accept the donation, though it wasn’t made clear why the county might benefit. “That’s staff’s approach to this,” Coffey said. Coffey said the one reason the properties would be surveyed is to get a title insurance policy. But there was little clarity about larger goals. Local governments (including Flagler County) have acquired lands to use as such “mitigation banks”—valuable environmental lands that can be sold to developers who must replace wetlands they’re destroying in one place with preserved wetlands in another. But mitigation banks have a speculative component: they don’t always pay off. Coffey said he’d gladly submit the outline of a bigger program of land donations, but he didn’t get clear direction from commissioners to do that. To McLaughlin, the plan was not a fit with the county’s comprehensive plan, and if private land-owners were looking to donate their land, they could do it through non-profits rather than through government. “one reason the properties would be surveyed is to get a title insurance policy”- Why does the county need title insurance on a free plot of land that’s virtually worthless to begin with? What exactly are we insuring against? And I don’t really see how accepting a free plot of land is bailing out a property owner? The guy’s tax bill is $25! If he wants to “donate” this land, just stop paying the taxes. After a few years the county will take care of the issue for him. What didn’t fir into their comprehensive plan was that the individual donating the land wasn’t a “business friend” of the commisioners. The county needs to open up this property so people build here, property values will go up, and revenues received will be sooo much more. Why aren’t the commissioners talking about what can be done to make all his possible???? All roads leading to Flagler Estates are in St Johns county, can’t get there from here. Maybe Flagler County can get St Johns County to annex that area. “showed no interest in unburdening private property owners who made poor investments,” WOW, now that would be a first wouldn’t it? The county should work with St john’s county to allow them to annex the Flagler side. There is quite a bit of development on the St John’s side. The countyshould not be allowed to keep territory it refuses to allow development on. 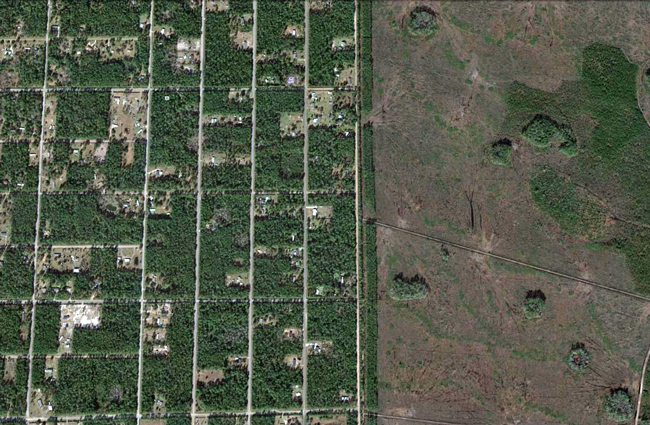 Flagler County side of Flagler Estates is one big broken promise. I would love to acquire a couple of these lots in flagler estates, flagler county. I love nature and birds and would be a perfect place to go bird watching, etc. I could go there on weekends with my little RV. Anybody knows someone who owns any of these lots. My contact number is 386-449-9145.